Modern crank rear seal packing kit. Made of high tech GraphTite rope, an improvement over the plain rope type seal. It seals more efficiently and is actually easier to install and trim. Includes knife and spacers for trimming. Inlet Manifold Gasket for the 1932-48 21 stud and 24 stud flathead V8 engine. 1949-53 Inlet Manifold Gasket Set for the Ford 239 Flathead V8 & Mercury 255 Flathead V8. Fuel pump stand to manifold gasket for the 1933-48 Ford Flathead V8 engine. 1932 - 1953 Flathead V8 Exhaust Manifold gasket set for the USA and French flathead V8. 8 Piece set. Six for the manifolds and two for the downpipe. Water pump gasket for the 1932-36 flathead V8 with the water pump in the cylinder head. Water Pump Gasket for the 1937-48 flathead V8 engine with the water pump as part of the front engine mounting. 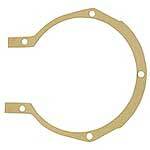 Carburetor base gasket for the Ford Flathead V8 with Stromberg carb. Sump Gasket Set for the 1932-34 Flathead V8. 4 piece set. 1935-48 Sump Gasket Set, Ford Flathead V8 85 & 90 & 95 HP. 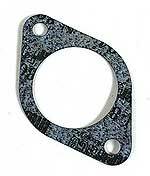 Model 'B' Sump gasket 1932-34. These are the Sump gaskets for the 1932-34 4 cyl engine. Korbestos Cylinder Head Gasket for the 21 stud Ford Flathead V8 engine. (also used on the Ford V8 Pilot), sold each. New Old Stock Steel clad 1932-37 Cylinder Head Gasket for the 21 stud Flathead V8, sold each. Copper 1932-37 Cylinder Head Gasket for the 21 stud Flathead V8, sold each. V8 60hp 17 stud Cylinder Head Gasket in graphtite. This is the most popular shaped head gasket for the 17 stud Ford V8 engine. Several types were used, so please check the picture carefully. 1938-48 Cylinder Head Gasket with round water openings, for the 24 stud Flathead, in Korbestos, sold Each. 1938-42 Korbestos Cylinder Head Gasket with triangular shaped water openings, for the 24 stud Flathead, sold Each. If you have Aluminum heads, you must use a composition (Korbestos) Type gasket because of chemical reactions between metals. 1949-53 Left Side Cylinder Head Gasket for the late Ford Flathead 239 V8 - Mercury Flathead 255 V8. 1949-53 Right Side Cylinder Head Gasket for the late Ford Flathead 239 V8 - Mercury Flathead 255 V8. 1932-37 Full Engine Gasket set with steel head gaskets, for the 21 stud flathead V8. Complete engine gasket set for the 1938-42 Ford flathead 24 stud V8. This set has the korbestos head gaskets, with the triangular shaped water jacket holes. Engine Gasket Set for the 1939-48 American Ford V8. 1932-34 Gasket set. Complete engine gasket set for the 1932-34 4-cyl engines. Comes with an asbestos head gasket. Made in USA. Basic engine gasket set for the Ford F1 pickup 6 cylinder 226 engine. 1932-48 Flathead V8 Timing Gear Cover Gasket.